E6 300 4Valve need more speed. Sounds like you are gear bound. Need higher rear gears or different transmission with higher final ratio. Something like a 4:17 ratio will get you 70 mph with a final trans output ratio of .79. Looking for this part used hopefully. It is available new, but just don't want to pay the price. Any help out there? Thank you. I will them tomorrow. Thanks Glen, I will try that avenue, after I check my other two R model parts trucks to see it they might fit, or if they are still in one piece. Where can I get a steering column boot for my 86 Superliner RW613 Dump Truck. Mack says that it is no longer avail in their system. 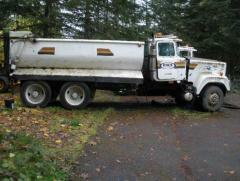 Mack Logger posted a gallery image in BMT Member's Gallery - Click here to view our member's albums! In the process of restoration. Had been partly dismantled, replaced front steer axle and putting in new trans and pto w/pump. 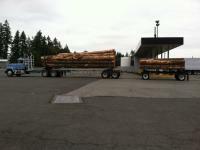 Mack Logger added images to a gallery album in BMT Member's Gallery - Click here to view our member's albums! Gross weight of 105,500. Did someone say PAYLOAD! This was taken in 2013 after restoration. Put about $50,000 in new parts as it is a daily working truck. Love the sound of that V8. Gona have one someday soon. Just got the E6-350 now.